This little guy was found early in the morning while we were getting ready for the weekend sales. He made his way over from the bronze fennel. The bronze fennel has been fun. Putnam Hill started growing it in the 90s when the nursery was called “The Herb Garden.” At that time, we sought out unusual herbs to grow. The main attraction to bronze fennel was its culinary traits. The leaves and seeds have a delightful, sweet licorice flavor, and cooks and chefs add it to stuffing, fish, salad dressings, and herbal teas. Over time its ornamental qualities added to the fascination. Bronze fennel gets this adorable, fuzzy, bottle-brush growing tip that is basically irresistible to pet. It is a leaf ready to unfurl, all fresh, new, and soft. As it pushes forth, it opens to create a wonderful, lacy texture. The color is a dark bronzy purple. Older leaves that are ready to slough off turn pretty shades of red. On a dewy morning or after rain, water droplets gather on the leaves. If you happen to be there when the sun shines through you are in for a sparkling treat. The flowers are yellow umbels similarly arranged to dill flowers. One year, I collected the seed heads of bronze fennel and spray painted them silver to put in the Christmas tree. They looked like frosty flowers or large snowflakes. We loved it. When the tree was taken down and the needles from the tree were swept up, I threw what was in the dustpan out the window. For the next several years bronze fennel grew outside the window. We enjoyed the flat-topped flowers and sparkly bronzy foliage as they intermingled with the orange daylilies. What a treat! It was the gift that kept giving. 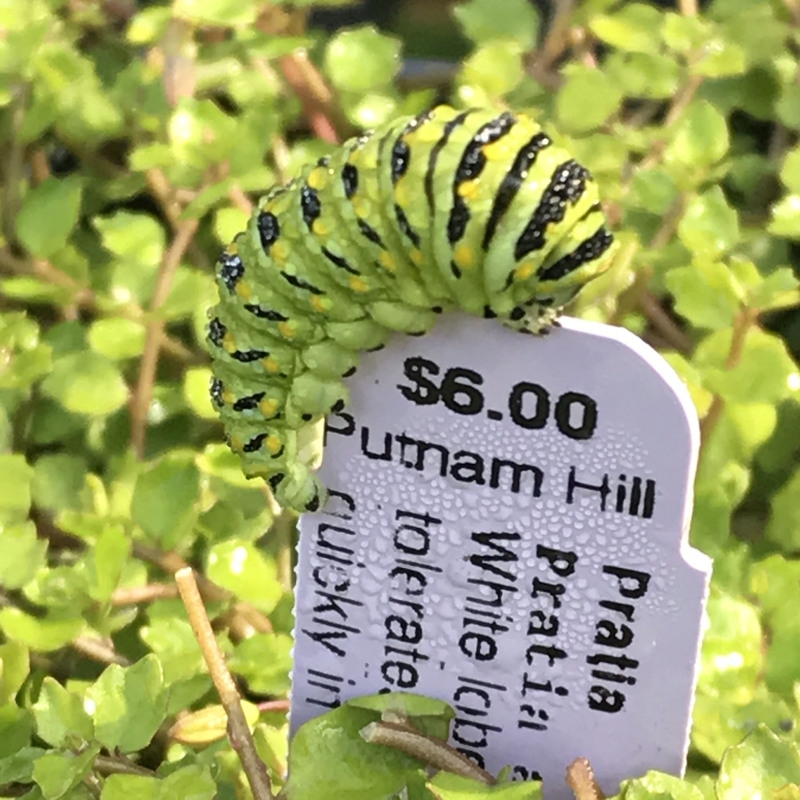 One of the goals of growing bronze fennel in the nursery is to sell them before the swallowtail caterpillars come and eat them all. Last year, we had a few flats left after spring sales and enjoyed watching the caterpillars grow from tiny specks to big chomping machines. The plants were eaten down to little nubs. This year we grew extra. In late April, I watched a swallowtail come and touch down over and over again on the fennel. Circle, land, lay an egg, take off, over and over again. Then the tiny little “‘pillars” were born and grew and grew until we had to designate a flat of plants just for them. One day they were all gone. I passed one marching along the terrace, no doubt looking for a place to hang and pupate. 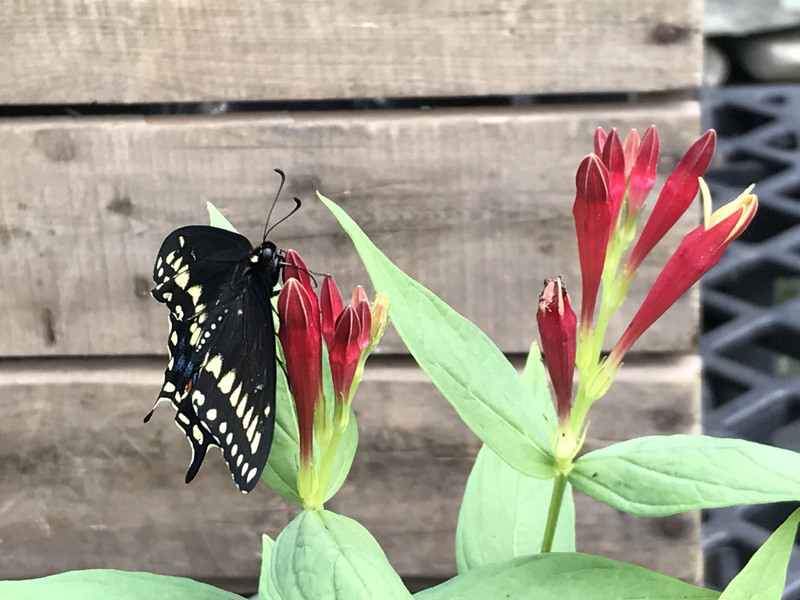 Last weekend during open nursery, customers and I watched as a young butterfly awkwardly flew up from somewhere in the plants. His shiny black wings were new and slightly crumpled, but his receptors were spot on. He flew directly to the spigelia flowers! We watched as he exercised his new wings stretching them open and letting them dry in the breeze. Then after some time, he took off and flew up toward the trees and sky. Wow!